A. Slow down and watch for traffic controllers and instructions. B. Stop immediately and wait for instructions. C. Maintain the same speed. Correct. Road repairs can cause the road to be slippery, and you may come around a corner to find a traffic controller with a handheld sign directing traffic, therefore be prepared to stop. grade gravel or dirt roads. In some cases the surface layer of the road will be removed completely and that could leave a loose surface; in other cases the repair can be localise, but gravel or loose stones may still be around the area. New chip seal will have lots of loose stone chips for a while until they wear away. 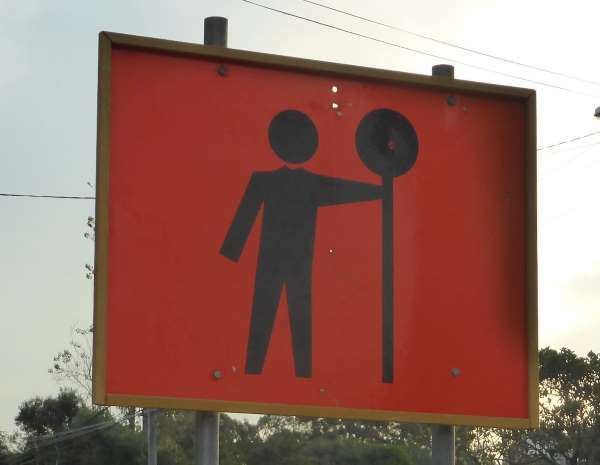 If there's a traffic controller the traffic controller will let you know when it's safe to pass through the road works. There might be vehicles coming the other way, or workers or machinery blocking the lane. Prepare to move to the right. If traffic is heavy then it's likely that it will either be backed up, or it will be starting to back up, so check that traffic ahead of you hasn't stopped suddenly. Merge right like a zip (alternate vehicles), and take car. If you are in the middle lane, make room for vehicles merging from the left lane. If you are in the left lane, be courteous and don't try to jump the queue or sneak up the inside. If traffic has backed up, beware of motorcyclists filtering through. As there is a lane closed there might also be loose gravel on the road surface. Lane closures might also be caused by workers working in close proximity to the road, e.g. repairing traffic lights, installing signs, working on bridges or gantries, or clearing up spills. For a list of road works signs and tarmac repair types, check out this article. Around roadworks, road workers are exempt from some of the rules that drivers must obey.